Marriott International, Inc. (NASDAQ: MAR) yesterday announced the opening of Four Points MiamiAirport, the brand’s second property in Miami and tenth in the state. Catering to the needs of today’s modern traveler, the hotel offers approachable design, stylish comfort and all of the brand’s popular extras. Owned by Economos Properties, the newly constructed Four Points Miami Airport offers 124 guest rooms, 1,000 sq. 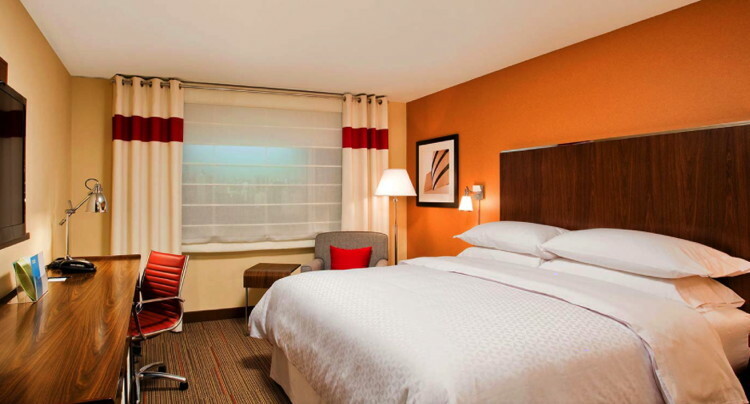 ft. of meeting space, a 24-hour fitness center, a business center, fast and free Wi-Fi throughout the hotel, and the brand’s iconic Best Brews and BBQ™, including refreshing local beers and seasonal BBQ-style appetizers at the hotel lounge. Four Points Miami Airport is conveniently located within three miles of the corporate offices of BV Oil Company, Harris Corporation, Magaya Corporation, Parker-Hannifin Corporation, and Refricenter International. For pleasure and easy exploration of South Florida, the property is only six miles from Miami International and Dolphin Malls. Dining and entertainment options are abundant in Doral, Little Havana, Coral Gables, and Coconut Grove, one of Miami’s oldest neighborhoods. Also within driving distance are the Wynwood Art District and Miami Beach. Miami International Airport (MIA) is four miles away, and the Port of Miami is nine miles away. “With reliable comfort for today’s modern traveler, our aim at Four Points Miami Airport is to make every traveler a repeat guest,” said Chris Lafontaine, General Manager, Four Points Miami Airport. Four Points is on track to expand its portfolio of rooms by nearly 50 percent by the end of 2019 with new hotels strategically located in nearly every corner of the globe. Hotels expected to open in North America by the end of 2017 include: Four Points Cleveland Eastlake; Four Points Juneau; Four Points Fort Lauderdale Airport/Cruise Port; Four Points Atlanta Airport West; Four Points Mt. Prospect (IL); Four Points Peoria (IL); Four Points Detroit Novi; Four Points Charlotte – Lake Norman; Four Points Spartanburg (SC); Four Points Arlington (TX); Four Points Houston Intercontinental Airport; Four Points McAllen (TX); and Four Points Salt Lake City Airport.